When people think of board games, the idea of a dusty shelf somewhere in their parents house comes to mind. We all know of, and have played the classics, but for the most part the board games of our youth don’t quite evoke the imagination. So the idea of staying home and playing one might seem like a foreign one. But the fact of the matter is that in recent years board games have come through a revival. Amazing storytellers and brilliant minds have worked together to create modern, interesting, beautiful, narrative driven games with unique play mechanics that can transport you into another world. So lets throw aside societal convention, rather than the typical “nice dinner and some flowers” for date night or Valentines Day this year. Stay in, cook dinner together and play a board game. This post contains some affiliate links and GamingWeekender may be compensated if you make a purchase after clicking on the links. 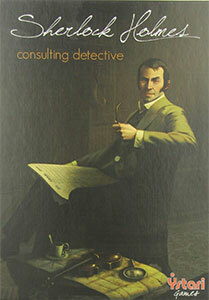 In this game you work with your partner to solve a mystery faster and more completely than Sherlock Holmes himself, which is no easy feat. There are no dice, nothing happens by chance, and luck doesn’t matter. The only thing that will win you this game is your wits. It’s up to you to discover evidence and trace it through Victoria era London, visiting locations, asking questions and following leads in this beautifully drawn world. The game even includes a set of newspapers for you to look through for clues. There are a total of ten cases to complete in the game. Who murdered Oswald Manson? Why are there two dead lions in Hyde Park? Well that’s up to you to find out. Claustrophobia is an exclusively two player game that focuses more on competition. Though we are talking about the English version, you can buy a French version of this game as well. In this game one player takes control of a group of humans, and the other, demons. The humans are more powerful but in very limited numbers, and the demons are weaker but almost innumerable. You play against each other based on a scenario from the rulebook, usually revolving around a goal the humans have to work towards (escape the dungeon, close a portal .etc). With the demons needing to stop them. The mechanics of movement and fighting are controlled by dice, and the exploration is done based on tiles, as you choose to move your characters around, you place down a tile at random once they reach the edge of the board, completing it as you go. Meaning no two play-throughs or dungeons will ever be the same, and that luck, in addition to strategy and time management, can determine the outcome. To all you video game lovers out there this is the perfect adventure, designed for two players this game lets you experience Columbia from another perspective. Focusing on the civil war between the Vox Populi and Comstock’s forces. You are pitted against your partner to see who can control the most territory, with the goal being to earn 10 victory points by drafting cards and battling your forces against one another. 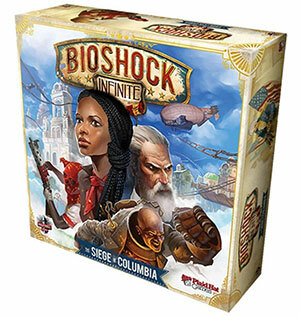 What makes it so interesting is you actually get to face off against Booker and Elizabeth. The two act as a sort of random destructive force, you amass your army in key territories to take out your partner and then Booker swings in and kills everyone. With no way of predicting when or who he will attack. Meaning you can’t risk attacking in too great a number, lest you lose your army in one fell swoop. 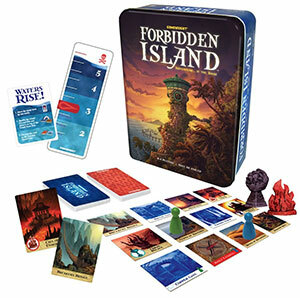 Another cooperative game, Forbidden Island has the players working together in a desperate attempt for survival. What I like most about this game is that it’s possibly even more fun with two characters, as all adding more people does is destroy friendships. You play based on a scenario from the included rulebook, which dictates how the tiles that form the ever changing “board” are laid out. As the game progresses some of those tiles will be reclaimed by the environment, becoming unusable. And the water level on the island will steadily rise, when it reaches a certain point, you have lost. To prevent this from happening you have to make strategic choices to collect items and artifacts that can help you reclaim tiles, move more easily, and arrest the rise of the water to save yourself. But on the way, sacrifices will have to be made. Another excellent cooperative game in which, as the name implies, a pandemic has broken out and it’s your job to stop it. 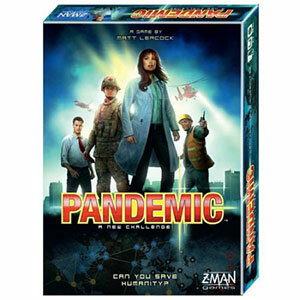 Each character plays as a specialist who can help fight the viruses that now threaten humanity. On each turn you can preform up to four actions. Travelling to cities, treating the population, helping to research a cure, etc. All of these actions are preformed by cards, within this deck of abilities are “Epidemic!” cards that will intensify the speed and virulence of the disease at random intervals. The trick is to mesh your characters abilities together, using their specialities to arrest the spread of the disease as quickly as possible. It’s easier said than done though, this game can be very challenging, and even though you’re working together I have seen it cause more flipped tables than some competitive games. 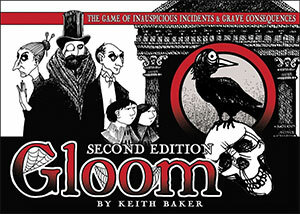 Gloom takes place in a sad, apathetic, quintessentially British world. The tea is cold, the scones are stale, the sky is grey and new personal tragedies befall you endlessly. But the greater the misery you endure in the mortal world, the larger your spiritual reward in the afterlife. With this in mind, the goal of Gloom is simple. Each player takes control of an eccentric “Addams Family” like group of characters. And you have to make their life as miserable as possible before they pass onto the afterlife, by adding on modifier cards like “mocked by midgets” or other strange ailments. While simultaneously making your opponents characters as happy as possible, blessing them with marriages and other momentous occasions. When all characters have passed away, the player who’s family has the lowest self worth, wins. The cards in Gloom are all made from transparent plastic, so each modifier you add onto a character will be seen until it is blocked out by the opaque section of another one. Meaning you can endlessly stack on cards to try and reach your goal of being the saddest family.